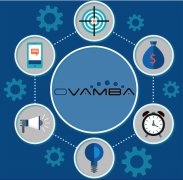 The new chatbot will be rolled out via Ovamba’s mobile app, Ovamba Plus (available on Android phones). Viola Llewellyn, Ovamba’s co-founder and president, and Prashant Mahajan, Ovamba’s CTO, discussed the issue of helping Africa’s “financially disenfranchised” with the Microsoft Partner Catalyst division. Many bank solutions, application forms and contracts assume that all SMEs are fully literate, and thus they “actually end up further alienating those who may not be able to read or speak French, English, Arabic or any other colonial language”, Llewellyn and Mahajan explained to the Microsoft Partner Catalyst team. “If we don’t address this then we are missing the true promise of fintech and the opportunity to include the informal sector in GDP count,” they said. So Microsoft assembled a team led by Shawn Cicoria, Lilian Kasem and Claudius Mbemba to help Ovamba create the chatbot. “Business training and formal education is a luxury not afforded to some members of Africa’s entrepreneurial sector, and is often taught in western languages,” Mahajan says. “We can help them to sustain growth by delivering business support and training in the language that they are most used to”. Ovamba is a US-founded fintech company that focuses that develops online platforms and mobile applications for SMEs in emerging markets. It was established in 2013 and has offices in the US, Cameroon, India, Mauritius and South Africa. It plans to expand to Ghana, Senegal and Sudan next year. Wants to secure the nation’s future post-Brexit. Get used to the idea of Microsoft embracing open source.